I’m always working on my food photography. I can take a mean picture of a pitboss or an old concrete block building but when it comes to edibles; I’ve got a long way to go. But, just like a blind squirrel, I can occasionally find an acorn nut to chew on to keep the pangs at bay. Like this photo of a one pound beef chuck rib that I swooped in on during a recent customer appreciation party at John Mueller Barbecue down on South First Street in the Bouldin Creek neighborhood of Austin. A big group of barbecue addicts from the Shaggybevo food board, as well as other walks of life, all gathered to stand around for a few hours so that we could get drunk, eat smoked goat, and listen to some live music. It was a hell of an affair. While all the food was good, and some was great, it was the beef chuck rib that my mind kept returning to to savor. Some people call it “brisket on a stick” but that’s really doing the rib a disservice. The hot bone radiates the smoke that penetrates the flesh creating a sort of caveman effect on the meat. When you eat it you enter an altered state of consciousness. It will melt your mind. I actually had to remove myself from the party for a bit as my proximity to a giant pile of these ribs was compromising my health. I couldn’t quit eating them. 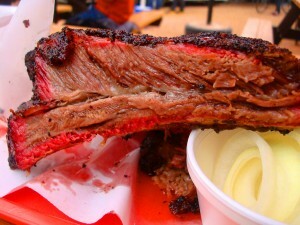 Where do you go to get your beef chuck rib fix in Texas? This entry was posted in Texas Barbecue, Texas Barbecue Photos and tagged Austin, barbecue, BBQ, best barbecue, Brisket, central Texas hot guts, food trailer, lockhart, sausage, Taylor Texas, Williamson County. Bookmark the permalink.